Full disclosure: I tried this recipe for sheer entertainment value. I saw it in a magazine and thought, “this sounds completely freaking weird.” Which of course, I took as a challenge. Bizarre recipe + my eyeballs = must do! Well, unless it’s a fall recipe with meat and fruit in it, which is seven kinds of wrong, people! And actually, these tomatoes were interesting. Herby, lemony, savory, a little boozy. But truly? I couldn’t really see them working as an appetizer or a salad, which is how Donna Hay magazine suggests you serve them. An appetizer, maybe, if you used cherry tomatoes, but then again, who has the time to blanch and then skin a bunch of cherry tomatoes? I’d rather go to a Star Wars convention, in full Chewbacca regalia, than peel a kabazillion cherry tomatoes. I ended up using the bulk of these for kitchen counter pasta, and they worked very nicely. I actually threw in about 1/4 cup of the marinating liquid, too, because I was feeling frisky. Next time I make them, and yes, I think I’m going to, I think I’ll strain the marinating liquid (using one of those siphons that filters out the oil), puree the tomatoes and the sans-fat liquid, and create a cocktail. Stay tuned for that little freakshow. 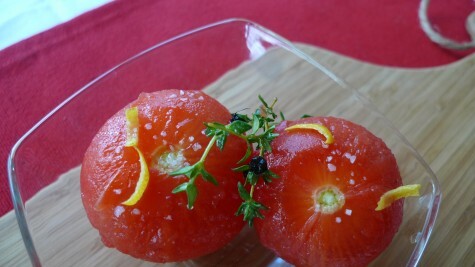 Using a small, sharp knife cut a shallow cross on the bottom of each tomato. 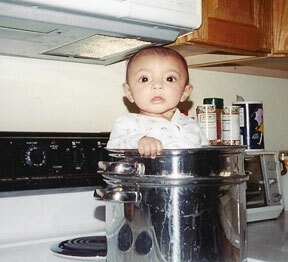 Cook in a saucepan of boiling water for 1 minute or until skins start to split. Transfer tomatoes to a bowl of iced water and allow to cool. Gently peel the tomatoes and place in a non-metallic bowl. Combine the vodka, lemon juice and peel, sugar, oil, oregano, pepper and salt and pour over tomatoes. Marinate at least 30 minutes. Serve as a side or in salads. Hmmmm….I may just have to try this. Me loves Vodka!! I agree; they just go together. It would make a great cocktail too. Oooh…I don’t think you can go wrong with this one. 1. Donna Hay recipe 2. Vodka – hello??! I once saw a cocktail party appetizer where you leave cherry tomatoes for the guests to dip into vodka and then a little course salt. Elegant and simple, especially when you can display each item in martini glasses. Mmmm…. oh ina. how bad can it be indeed? i got a chuckle out of that line–thanks for that, and for an interesting twist on maters! You sold me on the vodka! But I am waiting for the next freak show becaue I like the idea of drinking it! I mean tomatoes and vodka…how bad can that be?! This looks fantastic! I so want to try it and I can’t wait to see the cocktail you come up with. Yum!!!! The lemony savory tomatoes sound yummy! Admittedly I’m not a great cook, but what is a siphon that separates out the oil? Where can I find one of these magical kitchen tools? So if these tomatoes are an appetizer or part of a main dish, what beverage do you serve with dinner? Would it be a white or red wine? Or something stronger? Would you provide a sober person to guide your guests to their more comfortable seats after dinner? And be prepared to cover them with blankies when they doze off? cant wait for that freakshow cocktail! I’ll just take the lemons and vodka, okay? Mrs. Mayhem: It’s called a fat separator, and you can get them at any online cooking store–mine is from Williams-Sonoma. They’d make a mean addition to a tomato-vodka sauce! Vodka? On a Friday afternoon. I’m in. Wow! Those are some really boozy tomatoes. I may have to wait until next tomato season before indulging but I’m thinking a tomato basil martini with the ‘leftover’ juice would be awesome. Now this is my kind of tomato salad! perhaps a little fresh mozzarella to jazz it up a bit. Oh, and of course some dipping bread on the side. Ok, now I’m drooling! Your titles for your posts get me every time…. 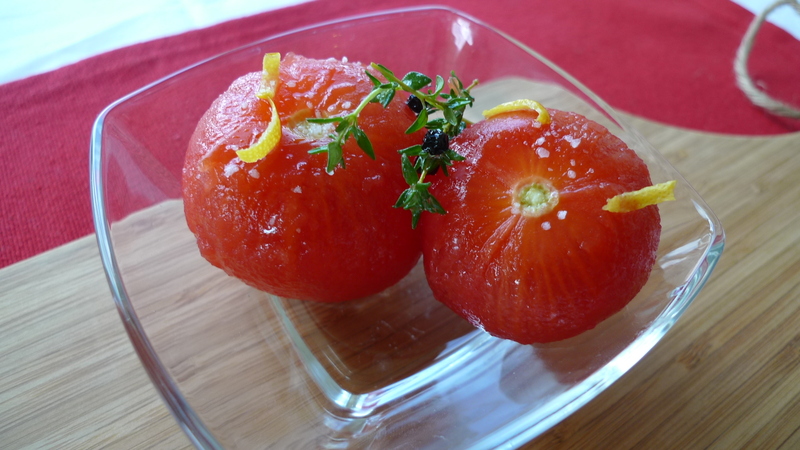 “boozy tomatoes”… love it……. This is definitely along the lines of the meal version of a bloody mary or some fancied up martini…..
You are absolutely, utterly delightful, and your blog is a joy to read. Boozy tomatoes!! I love it. making pasta with them sounds great too, my dad’s pasta alla vodka is one of my favorite recipes, so I’m sure I’d like this one too! Yes, I don’t see these as an appetizer either, but they do look pretty damn tasty. With pasta it would turn into a cream-less pasta alla vodka. You had me at Vodka. Love your new site! I like the way you think–coming up with ideas on how to make a magazine recipe really work for your own tastes and time constraints. Pasta idea sounds best to me. Not so freaky, actually. I’d be in line for that drink….kind of a Bloody Mary. What’s wrong with a Star Wars convention? I thought I heard somewhere you were dressing up as Chewy for Halloween. No? This sounds a little like a bloody mary with big lumps!! Great presentation. I’d have some of the “juice” as a cocktail. Trust Donna Hay to booze up tomatoes. They look cute but I’m with you….no way in hell I’d peel cherry tomatoes! You know what? I can see doing a labor of love and blanching/peeling 30 or so chery tomatoes for a brunch, can’t you? Like I said, it’d be a labor of love. How about I do several shots of vodka while looking at a tomato? Does that count? The cocktail sounds like a brilliant plan! These babies have bloody mary written all over them. What time is happy hour? I love seeing people trying recipes only because they are intrigued by a strange recipe! Go, girl! And I do think this would make the perfect cocktail! OK, I love vodka and I like tomatoes. However, I’m not getting what the vodka does to the tomatoes. Is it acting as an acidic to break them down? Maybe I’m analyzing too much and I should just eat the vodka and the tomatoes. Maybe in that order. That still counts as a veggie serving, right? Even with the vodka? I like it! Hurry! I just decided that little freakshow is exactly what I need to get through tonight and two more days of reunion events. I’m already running on empty! Thought the free booze would get me through, but now I’m dreaming of a TKWed bloody mary. FNWzSE Looking forward to reading more. Great post.Really looking forward to read more.